Built on the foundations of a series of buildings constructed in the 1700 and 1800s, the Villa Smeraldi complex is known by the surname of its most recent owners. The various structures of the property reveal the duality of its origins. 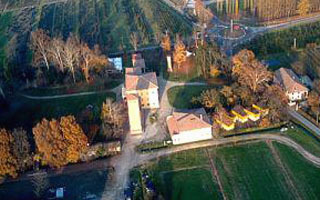 The villa, ex-stables and icehouse bear witness to the way of life of the aristocratic and land-owning classes of Bologna. The farmer’s house, granary tower, pigpen and dovecote confirm the historical function of the complex as the technical and economic center of a large agricultural expanse comprised of a dozen tenant farms.